The department of Agriculture, Food and the Marine were collecting eDNA samples at the main bridge in Monasterevin (Lat and Long: +53° 8′ 16.807″,-7° 4′ 0.160″ ING ref: Easting: 262509.43, Northing: 210094.81) accompanied by NPWS rangers. While taking the water samples they spotted one live but lethargic crayfish and one freshly dead crayfish – they collected and tested the freshly dead crayfish back at the lab. This one crayfish has tested positive for Crayfish plague with a CT value of 20, which is quite a strong positive. This result would suggest that the presence of Crayfish plague has continued to spread over the past 12 months in the Barrow catchment. The most northerly confirmed area in the Barrow catchment that I am aware of was just north of Leighlinbridge – this would have been confirmed about a year ago. Also, in September 2017, GMIT were carrying out survey work in the Barrow catchment and only 12 crayfish were caught by sweep net at a site in Monasterevin, with a number of crayfish recordings at various sites further North of Leighlinbridge. Please remember to Check, Clean and Dry your gear when moving around the rivers of Ireland. Canoeing Ireland has been reviewing its operational structure with regards to high performance activities for some time now. It has been acknowledged that the current support for this area falls below the standard set by other Olympic/Paralympic National Governing Bodies and that significant action is needed if Canoeing Ireland athletes are to fulfil their potential on the International Stage. To address this issue, Canoeing Ireland’s Training And Development Officer Jon Mackey is taking on the additional responsibility for High Performance. Jon is no stranger to high performance, he is a National coach for Kickboxing Ireland whose team enjoyed huge success at last month’s junior World Championship in Italy, finishing 4th in the medal table out of 65 countries. Jon is currently studying for a Masters degree in ‘Coaching Science in Sport’ at UCD. Jon will work closely with all the performance disciplines, Sport Ireland, the Sport Ireland Institute and the Olympic Federation to identify and nurture the undoubted talent within our sport. Canoeing Ireland are exploring ways to support Jon with his diverse roles, to ensure that all areas receive the attention they deserve. Paddy Boyd, Canoeing Ireland CEO, said “I am really delighted that we are addressing this important area of our sport. There is undoubted paddling talent in Ireland, borne out by recent results. It is incumbent on Canoeing Ireland to provide the support for our ambitious young athletes”. Classes: Male/Female Senior, ParaCanoe, Masters (35+), U-23, U-18, U-16, U-14, U-12/Guppies. In the case of K2 clubs may be combined to form crews. Entry details: Unlimited entry fee: Juniors €15, Seniors €25. 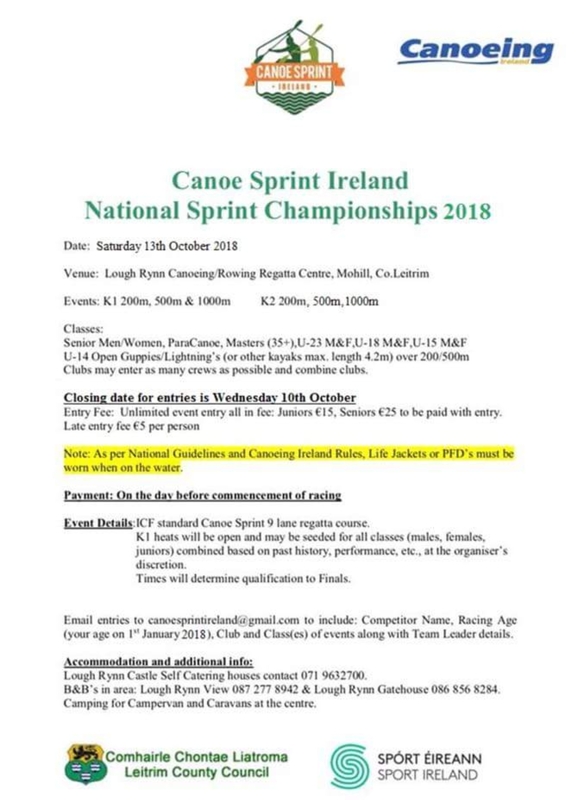 Entries should be completed online and emailed to canoesprintireland@gmail.com before Wednesday 10th October @ 6:00PM to avoid late entry fee. Late entry is €5 per person and will be accepted up until Friday 12th October @ 12:00PM. Entries will not be accepted after this. Payment will be accepted on the day before commencement of racing between the times of 8:00AM – 9:30AM. Failure to pay will result in a withheld entry. Event Details: ICF standard Canoe Sprint 9 lane regatta course. K1 heats will be open and may be seeded for all classes combined based on past history, performance, etc. at the organisers discretion. Times will determine qualification to the finals. Racing order: First race starts at 10:00AM sharp with K1 U14 200M heats, racing will proceed in ascending order of age and finals will occur after heats, followed by the 500m heats and finals and the 1000m heats and finals. Event will finish with the K2 500m heats and finals. As per national guidelines and Canoeing Ireland rules, life jackets or PFDs must be worn when on the water. Lough Rynn Castle self-catering houses contact 071-9632700. B&Bs in area: Lough Rynn View 087 277 8942 and Lough Rynn Gatehouse 086 856 8284. Camping for campervans and caravans at the centre.